What is the Virginia Street Tree Selector? 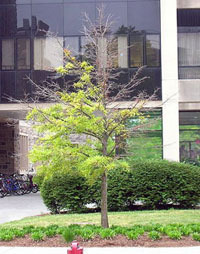 The street tree selector is designed to serve as a resource and forum for street trees. Trees in downtown areas are under intense pressures from pavement, buildings, and people. Many factors restrict tree choices in these sites: reduced rooting areas, extreme pHs, clearance requirements, etc. Finding a variety of trees that will perform well in these situations can be difficult. If you are planning tree plantings for a streetscape, a median, a parking lot, or main street, we hope you will be able to find some suggestions using the search functions provided here. The site is designed for Virginia communities, but will also be useful to the Mid-Atlantic region and beyond. In the tree selector, our aim is to show street trees as they really are--the successes and the failures. We encourage reviewers to post pictures and comment on the success of the planting shown. See our photo guidelines for more. Are you an Urban Forester, Municipal Arborist, Town Horticulturist or other professional? We encourage you to share your favorite trees via the treeselector. Post a review and picture. If any tree isn't included (to see the complete list, just click "Find a Match" with no qualifications) send us your recommendation at urbanforestry@vt.edu. Looking for More Information on How to Select Trees? Try going through our Site Evaluation and Modify process. The key to good tree choices is to match the right plant to the right place. An understanding of the "place" is the best place to start. This may be the best way to start for volunteer groups and nonprofits. Be sure and read about how the Street Tree Selector Works. We especially want to encourage city foresters and arborists, or others with experience planting trees in downtown settings, to share a “tree review” with other users. You can submit your experience, positive or negative, with a tree species or cultivar by using our forum. Digital photos additions are encouraged. Through your participation, the Virginia Street Tree Selector will continue to grow and improve. This tree never had a chance: Quercus phellos won't tolerate the high pH at this site. What Can I Expect from the Tree Selector? The Street Tree Selector will generate a list of possible trees that will grow on your site based on the site information you enter. The selector focuses primarily on shade trees suitable for urban and community sites. You can then link to the information from our databases concerning these trees. If a review has been posted, you can read about other people's experience using this tree as a street tree. Always thoroughly research any tree before making a final choice for your website. See our reference list. The tree selector is not an encyclopedia of woody plant material. It is not an ideal system for finding an ornamental tree for a garden. 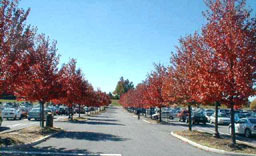 It is not the ideal system for selecting a tree based on ornamental characteristics such as time or color of bloom. The selector does not include shrubs and has limited representation of small stature trees that cannot be limbed up for pedestrians or vehicles or trees that are susceptible to pest problems on stressful sites. The Street Tree Selector is solely focused on sharing information and generating species lists for those difficult-to-plant sites such as downtown streets, medians, parking lots, and others. If you would like to learn more try our Frequently Asked Questions. Our aim is to provide a useful tool for greening Virginia’s communities. If you have suggestions or would like to report an error in the database—please contact us. We are very appreciative to the long list of contributors and resources we have relied upon to create this site. We gratefully acknowledge the assistance of the USDA Forest Service through an Urban & Community Forestry Assistance Grant in creating this web site. If you have questions or comments about this set of web pages or if you wish to report an error in any page, please e-mail John Peterson.